Here are a few tips my dance clients receive during and after a GYROTONIC® class that I would like to share. These tips are essentially all taught during a dance class, however, private and semi-private training allows an individual to focus on the areas that need more improvement to provide even more depth and clarity. Private or small group training also allows the individual to understand their own body and in their own time. Although these tips and suggestions are a few out of many, it provides an idea of what goes on in a GYROTONIC® class and how it can be beneficial to further improve dance performance. Often times dancers (well, anyone) tend to have either posterior or anterior tilt in the pelvis, in which they also tend to use during movement. While moving in this way may appear successful, problems and injuries that may occur (i.e. stiff hips and back) is, of course, not very useful to maintain longevity. A dancer can avoid this common mistake by maintaining a neutral pelvis, especially while standing. This connection can help provide the dancer a great way to practice and ‘preparation’ (the moment before you begin to move). An example of a pelvis that’s not in neutral is when a dancer is ‘tucking’ or arching in the lower back. So when this happens, when the working leg comes back into a position, the rotation muscles aren’t able to engage properly. When this leg movement is done properly with a neutral pelvis this means that the inner thighs and abdominals get the chance to work. Therefore, I encourage dancers to practice maintaining a neutral pelvis (and spine) before a class/performance by either doing homework given from the sessions or a few tendus and pliés with the same principle. Another common sight in dancers is over rotation, of the foot in relation to the rest of the leg. While this may be aesthetically pleasing, this often means that true rotation is not being used. This is especially important in plies and tendus. Using rotation the of the whole leg is will also help avoid injuries such as knee and ankle problems. 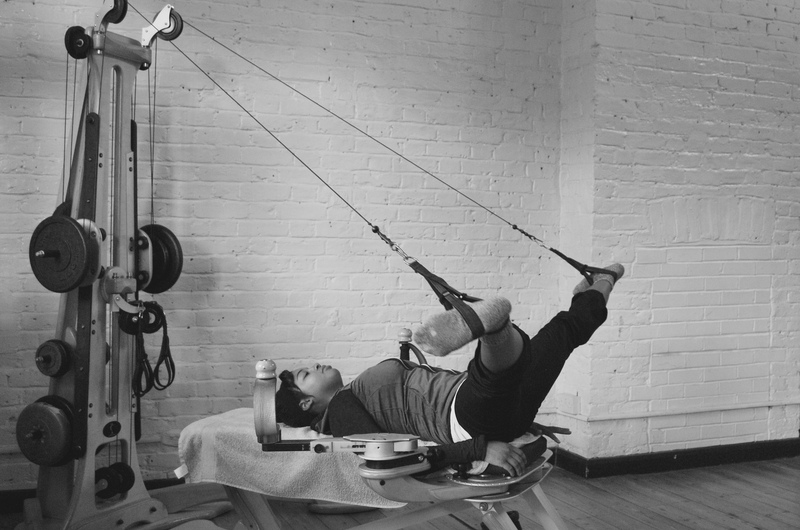 In the Gyrotonic hamstring exercises, clients are able to work on proper rotation (both internal and external) lying down which reduces pressure in the spine and allows more freedom in the hip. This way, the body can be more prepared when standing. During the hamstring exercises, it is reiterated to use energy through the entire leg to rotate from the hip, where the foot and toes will follow. Maintaining this connection will help to engage the appropriate muscles and therefore improve turn out. I advise my clients to take time before class, especially those with hips problems/ pain, to warm up the turn out muscles by practicing the corrections and homework exercises learned from our sessions. This way the dancer can notice when old habits come back or when the pelvis tends to move unnecessarily as mentioned above. Dance requires a lot of upper body movement thus, it can be easy to overuse the muscles that surround the shoulder girdle as well as the muscles that are used for rotation. The aim is to engage the appropriate muscles to support the back especially within movement. Instead reach the shoulders wide not just down. This way, when the arms are moving, the back is engaged and the arms can move more freely. In addition, a common theme in the Gyrotonic Method are arm movements that lead with the elbow while maintaining a long bend (often the same for leg movements as well), which is very useful for the use of port de bras. Leading with the back of the arm while maintaining a long bend in the elbow can further aid in the correct use of the shoulder girdle and rotation in the arm. The wider the shoulders, the longer the line, and the more efficient the arms will be when passing through positions quickly (like this amazing example). Due to dancers usually being flexible or hyperflexible, I often see a few common alignment deviations. One of them being a lack of rib cage connection standing, sitting, and in movement. Finding and maintaining this connection helps to support the back and maintain balance. The ‘back support’ that the ribcage connection provides is also important for use of the back of the leg. However, feeling this is a dance class is difficult of course, therefore I often instruct my clients to actually relax the ribs and lengthen the back of the body to then move. Being too far forward or backward throws the body out of alignment, which makes it difficult to stand, use the legs, and turn. Use the connection of the ribcage as an aid to stand taller, feel the legs, and become aware the the ‘back body’. Gyrotonic exercises emphasize maintaining a ribcage connection in all planes of movement (i.e. lying down, sitting, standing, rotation). Breathing also helps to find less tension, the proper amount of engagement, length, and expansion. It can be difficult to resist the temptation to use a pilè or cambré forward as an opportunity to stretch maximally during the beginning of a class, for instance. Warming up allows the body to engage and maintain stability throughout the rest of the class (while reducing the change for injury). Exercises taught in the beginning of class may require the dancer to already be warm. Otherwise, use the beginning of class as an opportunity to warm up. Additionally, obtaining a ‘long line’ in the body requires both proper alignment and strength to achieve an appropriate range of motion. The Gyrotonic Method focuses heavily on drawing energy internally to create external movement to then provide the desired length and/or stretch. Thus it’s important not to focus solely on the aesthetic of the movement. Timing is often crucial as it helps to make a dancer more musical. This, in turn, can help the dancer fire necessary muscles needed, which allows the dancer to overcome bad habits. Knowing how to stay with the tempo when learning a movement or phrase can further improve personal interpretation of musicality, coordination, and expression. 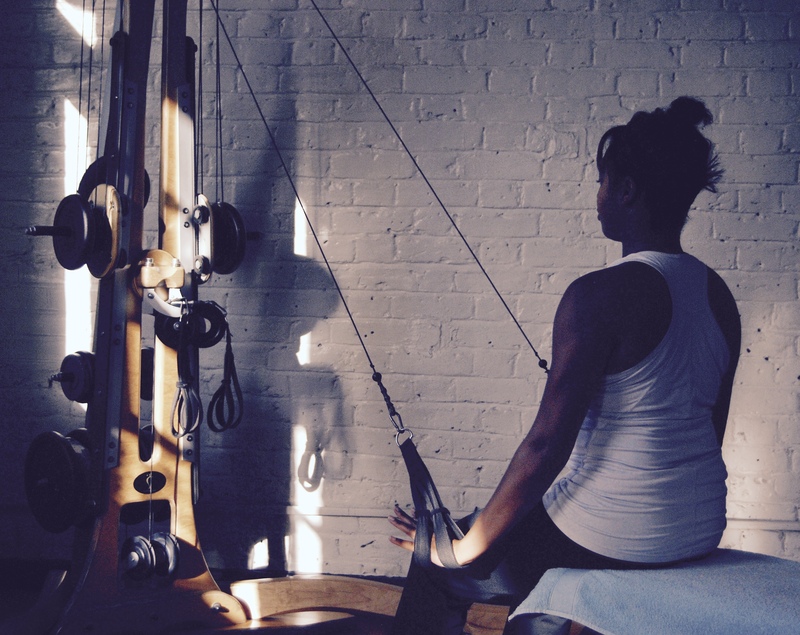 What makes the Gyrotonic method different from other forms of exercise is how it helps to create long, full movements with different qualities and playful rhythms. Within a Gyrotonic class, different tempos and rhythms are also specifically used to help increase awareness and strength (just liked dance). It’s important to remember that movement can involve different qualities, textures, and phrasing. Within a Gyrotonic session, clients are allowed to first learn the movement properly while gradually adding the breathe and the rhythm. If movement proves to become difficult to keep up, I ask my clients to ‘check in’ to see what connections/engagements may have been lost. Taking class and practicing movement is a time for an individual to become more knowledgeable and attuned with the body. Take time to ‘check in’ with what your body needs and how you need to achieve it.